I chanced upon a webpage where I got the recipe for this decadent chocolate fudge. I forgot to bookmark the site after jotting down the ingredients and procedure. The original recipe calls for pistachios to be mixed with the chocolate mixture.I opted to use mixed candied peel and dried apricot in place of pistachios. I chose a natural alternative as my sweetener instead of using condensed milk. The result was chewy candy with a delicate taste. In a bowl, combine chopped dried apricot and mixed candied peel. Set aside. 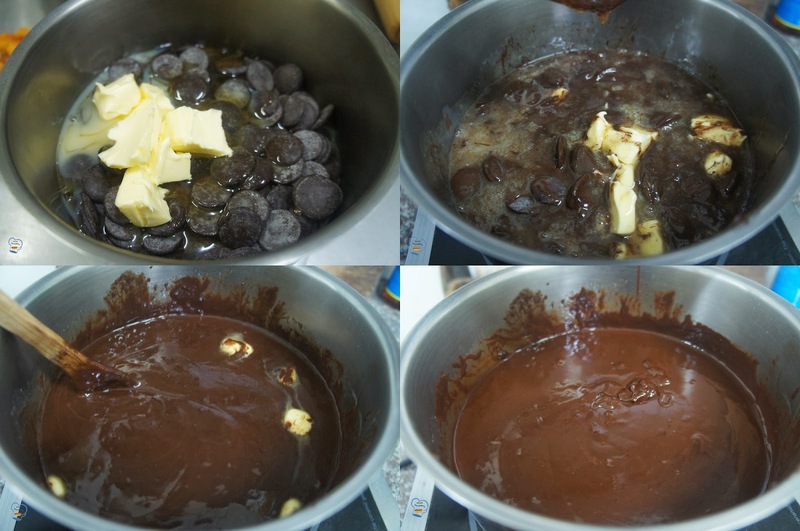 In a heavy saucepan, place the chocolate, honey, butter and salt. Cook on low to medium heat until the mixture melts. Remove from heat. Add the fruit mixture. Stir to combine. Pour mixture into a cookie sheet. Smooth top. Chill until the chocolate hardens. Or you can just form them into balls just like what I did. My plan was to slice it into square so I garnished the top with more candied peel to make them look more appealing. I struggled removing the slices out of the cookie sheet. It wasn't easy. They couldn't keep their shape well. I made a last minute decision to roll the mixture into balls.